Barack Obama invited President-Elect Donald J.Trump and soon-to-be First Lady Melania to join him and Michelle for coffee on the morning of his inauguration. Well, that’s the spin anyway. Though the fake news media presents this transition breakfast as an invitation, the act is actually a long standing tradition. Essentially the two couples have refreshments at the White House, this year’s libation will most certainly be “tea,” served begrudgingly. After tea, the couple take a limousine ride to where the inaugural ceremony occurs. Certainly there is not love lost between Barrack and The Donald. Remember Obama snobbishly saying, “At least I will have been president.” Oops. And the list of affronts by Obama to Trump continue to pile up, as the not-so-smooth transition continues to be disrupted by the Russians. Nevertheless, Michelle Obama has built up a good deal of contempt for Donald Trump. In some strange way, she considers herself “better” than the Trumps. Perhaps a taste of the good life at taxpayers’ expense has Michelle Obama feeling a bit uppity? Or perhaps Michelle Obama has passive aggressive anger at the very lovely Melania Trump? Because of the obvious disdain Black Camelot has for white people, both the coffee and the limo ride will likely prove awkward, to say the least. Then comes the end of the ride and the road for the Obamas. By lunchtime, Obama will have handed over the reins of the world’s most powerful nation to a man who vowed to tear down his biggest achievements and who defeated Obama’s chosen successor. A military aide with a briefcase holding the U.S. nuclear launch codes will stop trailing Obama and leave the U.S. Capitol in Trump’s entourage. After a rancorous campaign that blew away precedent, an election result that shocked the political establishment and a transition by Twitter that upended convention, the unorthodox will be overtaken — at least for a few hours — by tradition. Trump’s swearing-in will be “the moment on the head of a pin,” he said. Now we’re hearing about the jangled nerves, the simmering angst. And the outright panic being felt in DC as the big day approaches. “I feel like my city is about to be invaded,” were the words from a Leftist attorney. The District has been invaded…by the good guys. And they now have to deal with the bad guys. How retro, circa 60s in fact. There is little to worry about. These fascists are much like their leaders; eunuchs with more bark than bite. 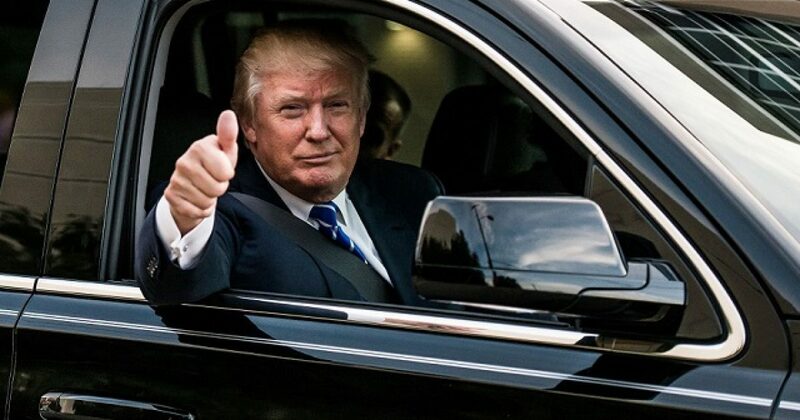 So come 12:01pm, Friday Jan 20, President Donald J. Trump will get the keys of the car from a man certain to be a has-been. In short order, President Trump will prove that America made a huge mistake electing Barack Obama and avoided an even bigger one by not electing Hillary Clinton. As for the limo, it might be nice to see a rolling stop, and President Trump booting both the Obamas from the limo.